As infrasound is felt rather than heard, be wary of working with it. Monitor levels with calibrated equipment at all times. You may be working at sound pressures high enough to damage hearing or objects, without being aware of the exposure. Levels may vary markedly in a room. For a low-frequency monitoring device, look at microphones used in bioacoustics or geological research. These notes are given for guidance only – please take safety precautions and conduct your own risk assessment before working. Any work conducted with infrasound is at your own risk. For our experiment we needed a very pure infrasonic note, with no harmonics, extraneous noise or other sounds in the audible spectrum that might give the presence of the infrasound away. We just wanted to hear the fundamental frequency of the pipe. This ruled out building an organ pipe of any kind – organ notes have a rich timbre because they are also rich in harmonics. 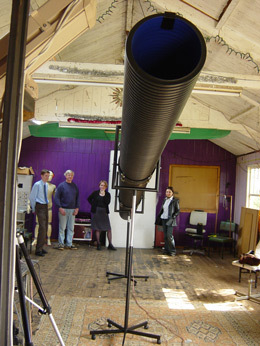 Our acoustic canon was made from stiff sewer pipe around 7 metres long. We placed an extra-long-stroke subwoofer around 2/3 of the way down this. Thus, it was stoppering a pipe around 4.7 metres long – one that was open at one end. In theory, this gives a resonant frequency around 17.5Hz (or at bit lower, when end correction is taken into account). NB We confirmed in tests this behaves as a quarter-wavelength pipe (not a half-wavelength) – effectively it functions like a pipe that’s open at both ends. To create infrasound that’s perceptible, we needed to move a large volume of air every cycle of the soundwave. A domestic subwoofer does not have a long enough stroke to do this. The extra-long-stroke is a servo-driven speaker that has movement of necessary amplitude. Using a signal generator, connected to the speaker via a power amp, we were able to create infrasound with low distortion (but inevitably some distortion due to imperfections in the system). Everything in the signal path, from the signal generator to the power amp and the subwoofer itself had to work efficiently around our 17-18Hz target frequency. We bought a Yamaha power amp that had a cut-off of 10Hz. We commissioned exhibit makers Tim Hunkin and Graham Northgate to adapt Peter’s design so it would fit in a transit van. They made it from three sections which clipped together tightly using flight-case catches. They also built stands for it and a steel suspension wire to prevent the pipe from drooping under its own weight. When we switched on the pipe, it soon became apparent that the suspension was itself a cause of distortion – it buzzed and rattled. We fixed this with some neoprene rubber on the mounts. 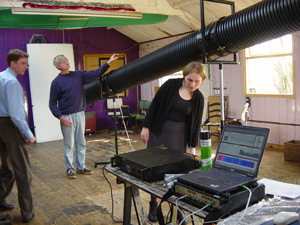 On switch-on day in Tim Hunkin’s barn (see photo), there was trepidation in the air as we gradually increased the amplitude of the signal generator. To our relief, the pipe resonated strongly at 17.5Hz and the infrasound was well above the threshold of perception. In the close quarters of the barn, the infrasound began to resonate strip lights, furniture and other loose odds and ends. At the pipe made very little audible sound, this was a disconcerting experience. Seeing these objects in motion for no apparent reason, it’s easy to imagine how infrasonic energy could be mistaken for a ghostly presence. Here’s a spectrogram showing the pipe in action during our concert in the Purcell Room, London, 31 May 2003. Audible music is being played at this moment too. You can clearly see the infrasonic pure tone at an SPL that far exceeeds the other sounds in the room. Source: Peter Lord and Dan Simmons, NPL. Alternative technique: a resultant note? Since we conducted this experiment, there have been various other interesting attempts to investigate the subjective effects of infrasound. 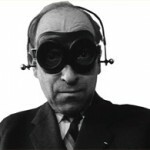 Studies have involved musicans, parapsychologists, architects and others. Many have tried to overcome the practical difficulties of building a pure infrasound generator by creating an infrasonic ‘resultant bass’. However when investigating infrasound, I think this resultant technique is hugely problematic. When we play two pure tones in the room together, a perfect fifth apart, our brain percieves a resultant an octave below the lower note (see this very helpful description by Colin Pykett, 2011). The sound we’re hearing is a ‘beat frequency’ – a resulting fluctation in the envelope of the combined sounds. At low frequencies, it feels like a deeper bass note in the room, an octave below the lower of the two notes. This technique is commonly used by organists who want to give the impression of a bass an octave below the stops they actually have at their disposal. However, in order to create that fluctuation, higher notes are present (the ones creating the effect). Therefore if you’re using a resultant to create infrasound, you’re actually exposing your test subjects to notes at higher frequencies. These are highly likely to mask or swamp any effects of the infrasonic frequency itself. I have yet to see a paper using resultant infrasonics that adequately addresses this issue.